This weekend (August Bank Holiday in England and Wales), we are offering the first three Princelings books for a combined total of $2.98. I think that works out at around £2.50. Book 1: The Princelings of the East is permafree on Amazon and Smashwords, and other online retailers. 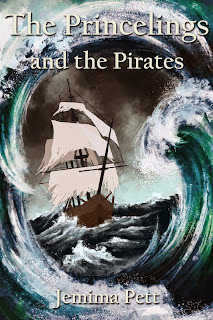 Book 2: The Princelings and the Pirates is on a special promotion of 99c/99p at Amazon using this link. You can also get it on Smashwords from the previous link, but may not reach places like iPad and Kobo before the special promo ends. If you see it at that price after the promotion, buy it while it lasts! Book 3: The Princelings and the Lost City is only available at Smashwords at the special price of $1.99 (about £1.50) using the coupon QV63U. Coupon ends 31st August, midnight Pacific time. This is a great chance to get started with the Princelings series before book 7, Willoughby the Narrator comes out this winter!